Just Jingle: Happy New Year! Yikes! Yesterday was a busy one! LOL! Three posts in one day! And...in all of that rush, I don't know if I got a chance to properly say HAPPY NEW YEAR! I hope you have thoroughly enjoyed your celebrations! I had a wonderful holiday season, overall, and I am ready to move forward! Usually I have a bit of trouble letting go of Christmas, but this year I'm good. I loved it, and now I'm good. Strange, but I'm going with it. HA! 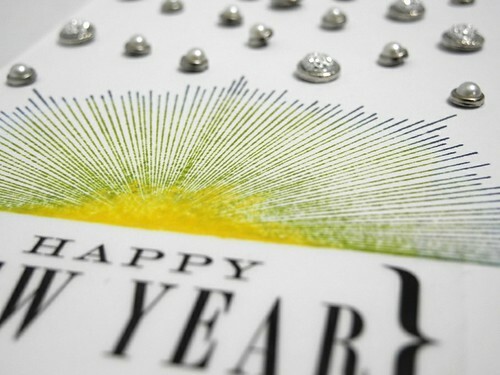 I have a fun Runway Inspired New Year's card to share with you today! 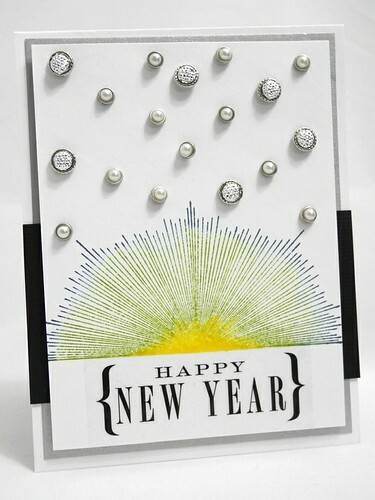 Here is the photo from the Runway Inspired Challenge Blog that set me off in the perfect direction for this fun card! The design is from the Bibhu Mohaptra Spring 2013 line! Fresh and ready to go! YAY! Those colors, of course, stood out brilliantly, but I also wanted to capture a bit of that burst pattern. I found this stamp from the Market Street Stamps Shine On set to be a perfect fit! I used several ink colors (four total, two blues, a green, and a yellow) to ink my stamp. I LOVE how that turned out! I then added a skyfield of twinkling stars by adding Eyelet Outlet Brads to my design! SO FUN! The sentiment is a perfect sticker from SRM Stickers! LOVE THAT!!! I also have another fun card up over on the Eyelet Outlet blog using this same stamp set in a totally different way! You can check that out HERE! So...I hope your day is pretty much AMAZING!!! this is just amazing! how exactly did you add so many ink colors to the same stamp? wow wow wow - this is so awesome!! i almost had a heart attack seeing all that bling on one card! as a scrooge card maker I could hardly stand it, but oh my what an effect! Happy New Year, Jennifer! I LOVE this card. Those brads are amazing and I love the multi-inking on the rays! Also, congrats on making the Fresh Squeezed Stamps DT!! Kinda love this, those brads are fantastic and so is all the color on the stamp! LOVE this card! You make that SRM Sticker sentiment rock! This card just explodes HAPPY!! Love it. oh my this is totally fabulous..
Wow! Love, love your take on this challenge Hingle! What a fun card! I love the "bubbles"
Such a beautiful (and glitzy!) card :) Thanks for joining us on the Runway! Such a fun card! Love all the bling and the colorful sunburst! So glad you joined us over at the Runway Challenge!! Be Mine! - Squeeze-A-Palooza Goodness! The Contenders Blog Hop - You Amaze Me! Doing the Moxie Fab Polka! Woodgrain and Free Stamps, anyone? Crafty Shelf - The Craft's Meow CUTENESS! Cool Beans and Warm Thanks! It's Time for a Gourmet Sketch! I have some Fresh Squeezed News!! !